While many of us have had a hot dry summer and cotton knits or socks and washcloths have been all that we can muster the energy to knit, fall is close and the holidays (the gift-giving kind) are, too. This is the season that knitters start thinking about knitting with wool and thicker yarns again. This week I’m introducing you to Universal Yarns’ Classic Shades family of yarns, and for a couple of days we’ll look at Classic Shades Metallic. Classic Shades Metallic is a cozy, self-striping yarn that features long color repeats and a slight twinkle of metallic thread. It’s a single-ply yarn with about 3 twists per inch, making it sturdy without feeling heavy or dense. It’s so sturdy that Universal Yarns has created a free pattern for a backpack. Classic Shades Metallic comes in 8 colorways (scroll down). Each one has 4 dominant colors and in-between shades form as the dye makes gradients from one color to the other. Another effect they’ve added to the yarn beyond the gradual transition from one color to another is that in some places the colors are marled together. Spinners create a marled look by spinning strands of light and dark colors together. When knit, marled yarn has a tweed-like appearance. Here are 4 of the colors. Six of the Classic Shades Metallic colors have a pink to fuchsia colored thread of glitter that’s less than 1mm wide. One color, Urbana, has a blue tinted glitter, and Zenith’s sparkly strand looks like titanium to me… its darker-than-silver glint is also part of its colorway. The thinness of the glitter strand makes it a very subtle addition to the yarn, and it’s perfect for those who aren’t into the bling-bling, but would like to spice up their knits a bit. The fiber content of Classic Shades Metallic is 69% acrylic and 29% wool — the glitter makes up the last 2%. The manufacturer doesn’t say what kind of wool it is specifically, but as you’ll see in tomorrow’s post, the model who wears the item I knit with this yarn wouldn’t tolerate an itch factor, and she wore it in summer temperatures without complaint. This says to me that the wool is from sheep that yield an extremely soft fleece. Close up of the Umbrella colorway showing the glitter and halo. While the acrylic content of the yarn is substantial, you still need to wash by hand in cold water. But, the acrylic fiber does add strength and memory to the yarn. The acrylic fibers are longer than the wool ones, so they hold the yarn together, while the wool ones create a very slight soft halo — yarn blooms while you knit with it. When I swatched with Classic Shades Metallic, I tried different needles: an aluminum pair with dull points; a lacquered wood pair with medium sharp points; and a nickel plated pair with sharp tips. I found that the twist, while tighter than some single-ply yarn I’ve worked with before, wasn’t tight enough to handle a super-sharp needle. The yarn split only occasionally on me while I was swatching, but I found that it caught on my left needle when I was switching between knit and purl stitches. The dull aluminum needles were great for dealing with that issue — I had no splitting at all. But, my aluminum needles are more than 20 years old, and the coating is wearing off. Because I didn’t want my yarn to turn gray, I used my wooden needles. The slipperiness was perfect and I really didn’t have to deal with splitting the ply too much…maybe 3 times in the whole project, and nothing that caused a grievous error. If you’re new to knitting, I would suggest using dull plastic or aluminum needles with Classic Shades Metallic until you get used to how it behaves for you. 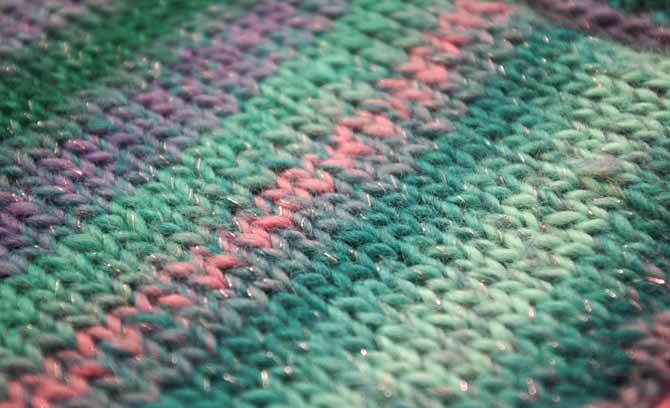 In tomorrow’s post, we’ll look at the project I knit with Classic Shades Metallic.